SANTA CRUZ ISLAND — By now, just about every news service has reported on what happened near Santa Cruz Island, in Channel Islands National Park, during the early morning hours of Dec. 2. The U.S. Coast Guard Cutter Halibut was offshore in search of what was thought to be a panga — a type of open vessel favored by Mexican smugglers — operating without lights. With blue lights flashing, Coast Guard officers disembarked in an inflatable boat to investigate. As the Coast Guard neared the panga, guardsmen heard a sudden revving of the engines and were rammed or “T-boned.” This action knocked two of the Coast Guard personnel overboard from the inflatable boat. The men were rescued quickly, but one had suffered severe head trauma and died, and the other is now recovering from more minor injuries. (See “USCG Petty Officer Killed in Run-in with Panga” to read more about the incident). What isn’t well known is that since Dec. 2, there has been an ongoing investigation on Santa Cruz Island by National Park Service law enforcement rangers, and that the island was closed to all visitors — including boaters who might want to anchor in park waters, which extend out 1 nautical mile around each island in the national park — for four days, reopening on Dec. 6. 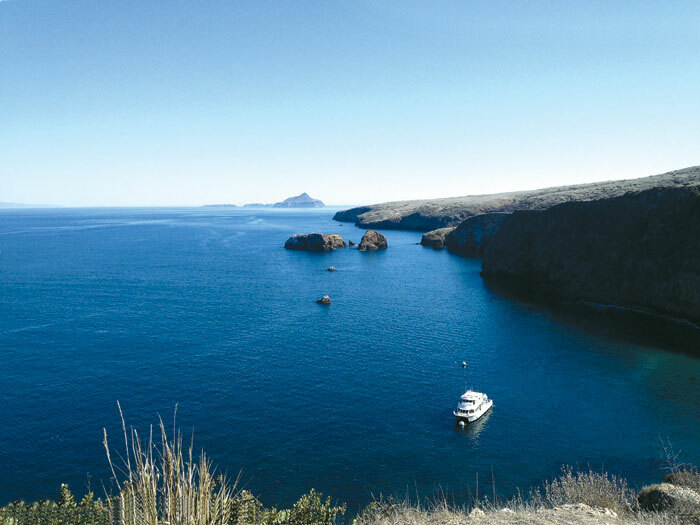 “In an effort to ensure public safety, we have temporarily closed Santa Cruz Island to all visitors,” stated Yvonne Menard, chief interpretation officer and spokesperson for Channel Islands National Park, during a phone call Dec. 4. On Dec. 2, the normally scheduled 9 a.m. ferry crossing from Ventura Harbor to Scorpion and Prisoners harbors on Santa Cruz Island was cancelled. Instead, Island Packers’ ferry boat Island Adventure was sent out mid-morning to help in the evacuation of all individuals who were camping or working on Santa Cruz Island, leaving only a group of law enforcement park rangers. The Park Service is stating that it cannot comment further on activities that may be under way on Santa Cruz Island, due to an “ongoing, active investigation.” Park personnel haven’t explained why the island was closed to the public, or why they needed to evacuate all non-law enforcement individuals from the island. Are Any Suspects Still on Santa Cruz Island? While waiting to pick up passengers in waters a mile offshore, a ferry boat captain told The Log he spoke with law enforcement rangers and crew from the cutter Blacktip — and through this conversation, he understood that a search was on for several individuals on the island who weren’t supposed to be there. The likelihood exists that more people were involved in the panga incident than the two individuals that were apprehended from the boat — and that these others were put ashore at Smugglers Cove, on the island’s east end. Coast Guard Cutter Blacktip was patrolling the island during the time that the ferry boat arrived at Prisoners Harbor around 1 p.m. Dec. 2. The ferry vessel captain was expecting to pick up four campers, in addition to those passengers who were waiting at the pier. However, the campers who had spent the night at the Scorpion campground Dec. 1 were apparently already en route Dec. 2 to the Del Norte camp, about a 13-mile hike west from the campground. When the ferry vessel was ready to pick up passengers at Prisoners Harbor, the campers were not available. Rangers were able to locate the four campers later and, on Dec. 3, a National Park marine patrol vessel provided them with safe passage back to Ventura Harbor. After the panga incident off Santa Cruz Island, marine radio traffic was overheard between the captain of a commercial fishing vessel and the Coast Guard, stating that he had retrieved a floating “bale” from the ocean waters between Anacapa Island and Santa Cruz Island. The skipper told the Coast Guard that it appeared to be marijuana. The Coast Guard requested that vessel proceed to the Channel Islands Harbor Patrol dock with the package. Channel Islands Harbormaster Jack Peveler confirmed four bales of marijuana that had been spotted in the waters off Santa Cruz Island Dec. 2 by two commercial fishing vessels had been taken to the Channel Islands Harbor Patrol dock and were now in the hands of Homeland Security.